It's now been two weeks since we made our decision to purchase Church Community Builder as our church management system software. I can't help but notice that when one googles "Church Community Builder," that Church Requel is now fifth on the Google page. Many other churches are watching our installation, so I feel some responsibility to let everyone know what is happening. I hope to keep a running journal here of our progress. These posts are those of a non-technical executive pastor. If you'd like a more technical discussion, check out the blog of our I.T. guy (Jonathan, my son) over at CrewNeckTech. However, I'm not sure exactly how we would have done this if we didn't have someone who speaks "Geekese" like Jonathan. In fact I'd say this is something for potential buyers of the software to consider. As good as the tech folks are at CCB, the executive pastor better make sure he has someone with high time availability and I.T. competency and database management expertise. 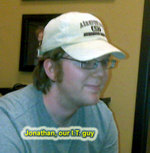 In our case, Jonathan has many other I.T. duties and Magnification Department responsibilities. Our management team made the decision earlier this summer to take away some of his Mag Dept. duties to free him up for the CCB conversion and the design of our new website (still to come). Our next big hurdle was the financial inputs. We made the decision that after all the giving was recorded for the third weekend of August into our Shelby database, no more data would be input into Shelby. We had one week to get the database transferred to CCB. But also during that week, based on the faith that the transfer would indeed happen, I instructed our finance people to watch the CCB video on financial records. Monday was Labor Day. Tuesday morning we assembled our financial secretary, our finance director, and Jonathan into a room and began inputting the batches into CCB. This went exceedingly well. I am told that there were actually fewer keystrokes involved for our volunteer financial secretary than she had before. This was really great news, because she admitted to me the week before that she was concerned about the change. Tuesday was a huge day for our CCB conversion, because after working with the finance folks, we then introduced CCB to our administrative assistants. I bought them lunch and asked Jonathan to provide an orientation to them. We set up in our conference room and Jonathan demonstrated the software for them. This proved to be a really great idea, because we would do the same thing for the entire staff the next day (today). By running through the demo with the smaller group, Jonathan had the opportunity to practice before speaking to the entire staff. It gave him a chance to put his talk together. It also gave us a chance to speak more intimately with our admins, who after all, will be the real leaders with this new software. We are honoring them as the ones who will become the real CCB experts. Some readers may wonder why we are investing so much of our own time and effort for training. After all, won't CCB provide training to us? Yes, they will. Our contract calls for a 4-hour virtual training session via webinar (scheduled in another week) and a two-day personal on-site training from a CCB trainer (scheduled for November). Having said that, I can't tell you how important I feel our own involvement has been in training our people. The orientation session yesterday with the admins and today with the entire staff has really whet the appetites of our staff to want to know more. Today we conducted our normal, monthly staff meeting (first Wednesday of every month). I dedicated almost the entire meeting to the CCB Orientation. We moved the meeting from our normal location to a better, more video oriented classroom. We brought in lunch. We ran the basic, introduction video (from the CCB website). In other words, we didn't take anything for granted. Even though we asked them all to watch several training videos on their own, I realize they are all busy people and probably only half of them actually watched one of them. We took one hour and ran through several highlights of the program. Several different times, people stopped the presentation with questions. Jonathan would take a few questions and then get us back on track. The effect was incredible. We left the staff excited about what is coming up. We left them at the end of the meeting wanting to know more. As a result, next Tuesday, when we conduct our 4-hour virtual training with CCB, our staff will be motivated and ready to learn. One thing is greatly apparent to me. The CCB software, as great as it is, will do little by itself. The implementation process is incredibly important. To the great software (and everything I see tells me this is going to be FANTASTIC! ), any church must add the ingredients of technical expertise and leadership. Leadership is my job. I'm already thinking about the issues of getting all of our calendars over into the CCB calendar. I'm thinking about how and when we move these training sessions from staff to volunteers, and then ultimately, to our congregation. This whole time, as we're charging forward, we also have to be sensitive to individuals who will raise questions and concerns that always come with change. These first two weeks have been busy ones for us. I have the feeling this is only the beginning. I am committed to seeing this process through for the benefit of our congregation. And I am committed to continuing these updates for an internet, multiple church audience considering whether or not to make the CCB commitment. Stay tuned for more to come.